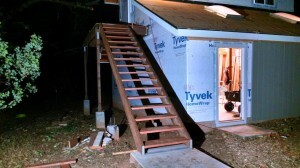 I built my deck stairs this weekend! It was a bit tricky getting the geometry correct, as there’s no floor to which I could directly measure the rise and run. I had to establish a level and plumb reference point and then measure off of that. Eventually I got it worked out. The stair treads are construction heart redwood, which seemed like a good choice for a California project. The stringers are ACQ pressure treated. I didn’t finish up until about 9:30 Sunday evening, which is kind of late but I really wanted to complete this part of the project. The center supports aren’t installed yet but the stringers are plenty strong to support one person even without the additional bracing.